This refreshing oil combines certified organic Shea Butter with African Water Mint & Ginger to rejuvenate skin with an invigorating scent. Pour into a warm bath to create a fragrant spa bath. Gently rub into skin after shower or bath to restore moisture and provide the ultimate protection. Warm in hands to use as therapeutic massage oil. 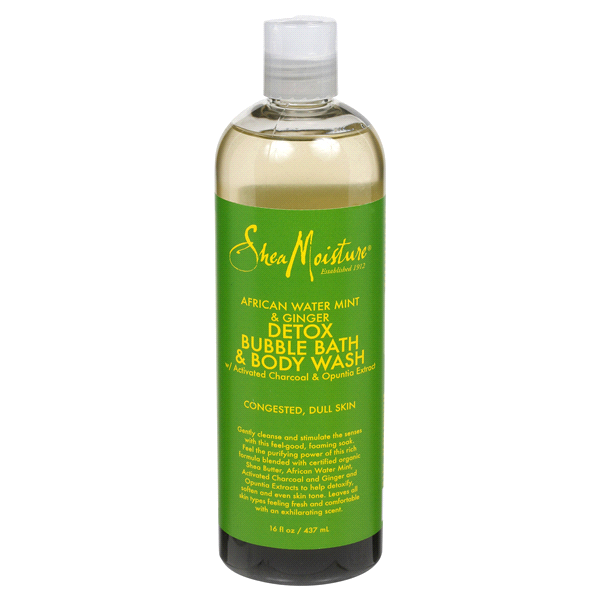 SheaMoisture's African Water Mint & Ginger 2-in-1 Detox Bubble Bath & Body Wash gently cleanses while stimulating the senses. The purifying power of this rich formula, blended with certified organic Shea Butter, African Water Mint, Activated Charcoal and Ginger and Opuntia Extracts, helps detoxify, soften and even skin tone. Leaves all skin types feeling fresh and comfortable with an exhilarating scent.